The Midtown Greenway is a sunken rail-to-trail-with-future-rail traversing the diverse (and dense, by Twin Cities standards) neighborhoods of South Minneapolis, from yuppie haven Uptown, through Midtown and past the Midtown Exchange, crossing the Hiawatha light-rail-with-trail, and eventually landing in Longfellow. The trail very nearly links two major park systems: the Chain o’ Lakes to the west and the Missisippi River on the east. Current proposals would put either LRT or a streetcar along the south half of the former freight ROW, as part of a LRT service to the near southwest suburbs. There’s no view whatsoever — neither the babbling mountain brooks of Denver’s flood control ditches nor enchanting murals on the concrete retaining walls — and the plants have died. Still, the rhythm of all those bridges crossing overhead looks pretty neat at bicycle speeds. As with all grade-separated trails, it’s not cheap: a good number of the bridges have been replaced, a new grade-separated crossing is underway at Hiawatha Avenue, and a CCTV/”blue light” security system had to be installed. 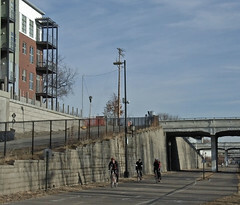 Yet the trail is definitely encouraging new investment, like the lofts on the left. This entry was posted in public space. Bookmark the permalink. I like this picture and this site (um, the website too, but I mean this place in MPLS). I still hope to visit MPLS in the spring, but I think I will rent a bike instead of bring my own (Amtrak is more expensive than Mega Bus/Greyhound and they all want you to box up the bike).